The Lemon Coco Loco starts with the classic Dirty Blondie base, flavored with real lemon zest. Shredded coconut is blended throughout, and a little coconut sprinkle on top finishes these babies off. The one that started it all! 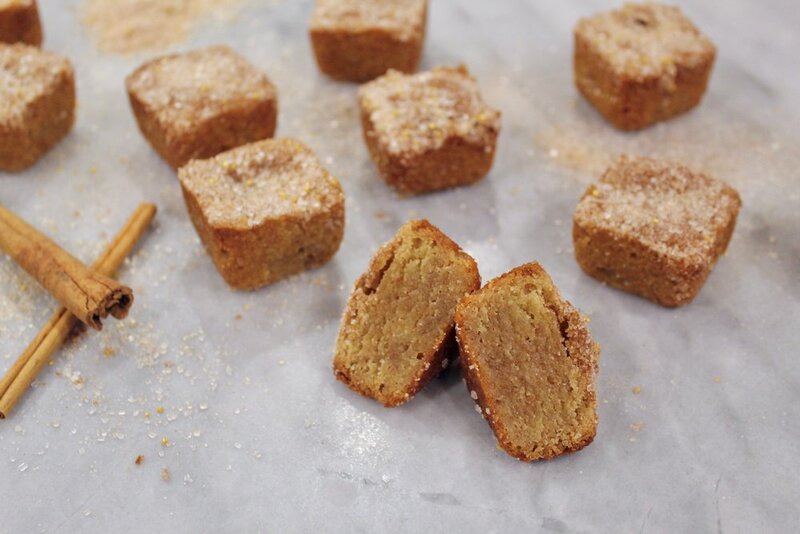 The OG - Snickerdoodle Dirty Blondie blends my signature brown butter batter with just the right amount of cinnamon and sugar. Topped with an ample dusting of gold crunchy cinnamon sugar blend. This ain’t your grandma’s snickerdoodle (no offense grandma). The Celebration takes my signature brown butter batter and adds an excessive amount of rainbow sprinkles and white chocolate chips. It's topped with more sprinkles, because….it’s a celebration*! 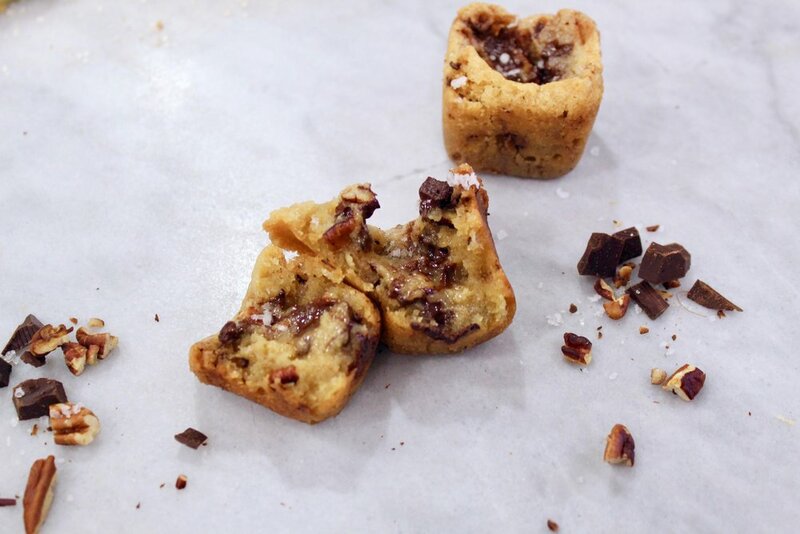 The Dark & Nutty starts with my brown butter batter, and gets mixed with dark chocolate chunks and toasted pecans. And to take these over the top, a pinch of flaky sea salt adorns these beauties for the perfect finish. 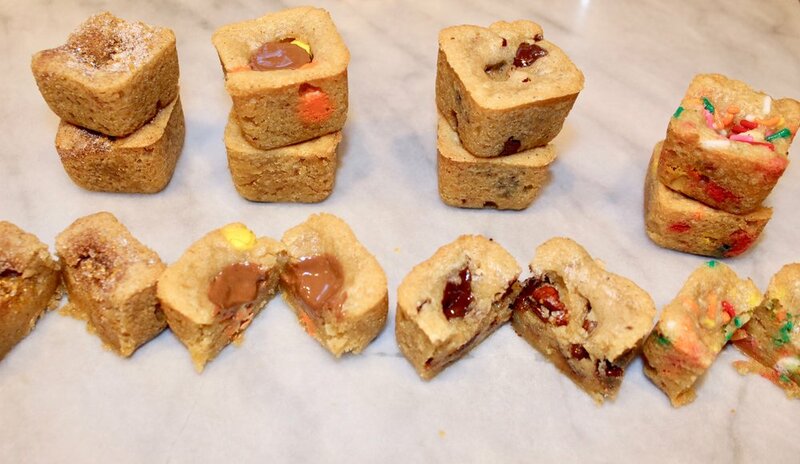 The Peanut Butter Bliss takes my brown butter batter, and is then crammed with peanut butter candy pieces throughout. I top things off with a mini chocolate peanut butter cup, a pinch of sea salt, and the tears of unicorns*. 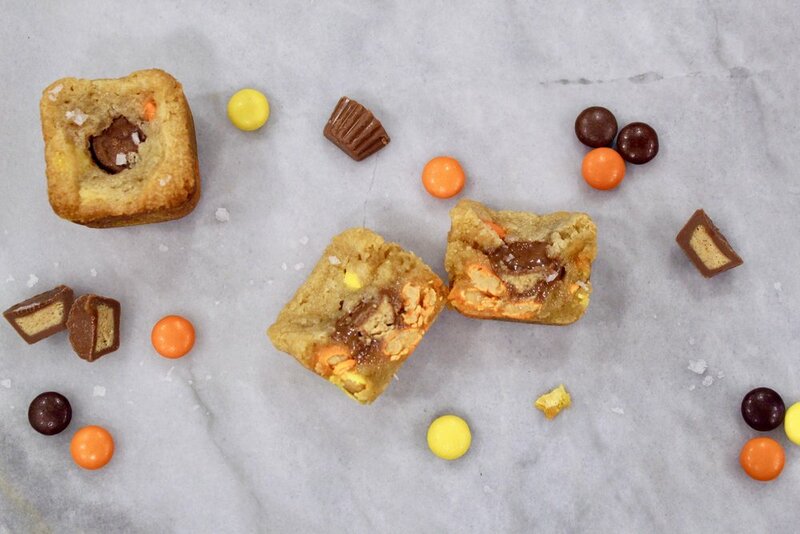 Grab a glass of milk, these blondies are not for the faint of heart. Wanna try more than one? The Dirty Blondie Bombshell is a variety pack filled with 12 bite-sized blondies, 3 of each of the Dirty Blondie flavors*! *If you’d like a different flavor combination, scroll down to the custom bombshell! Oh Baby! is a twist on the Celebration. Instead of rainbow sprinkles you can choose blue, pink, or yellow sprinkles! The Oh Baby! is absolutely perfect for a baby shower or for sending to the new family! IF YOU’RE SENDING THESE AS A GIFT, YOU MAY ENTER A MESSAGE TO BE INCLUDED WITH THE SHIPMENT!! Wedding Bells is another twist on the Celebration! Instead of rainbow sprinkles, I use white sprinkles, and also add some gold sanding sugar to top things off. Wedding Bells is wonderful for an engagement party, bachelorette celebration, wedding or shower! Want to pick your own flavors? 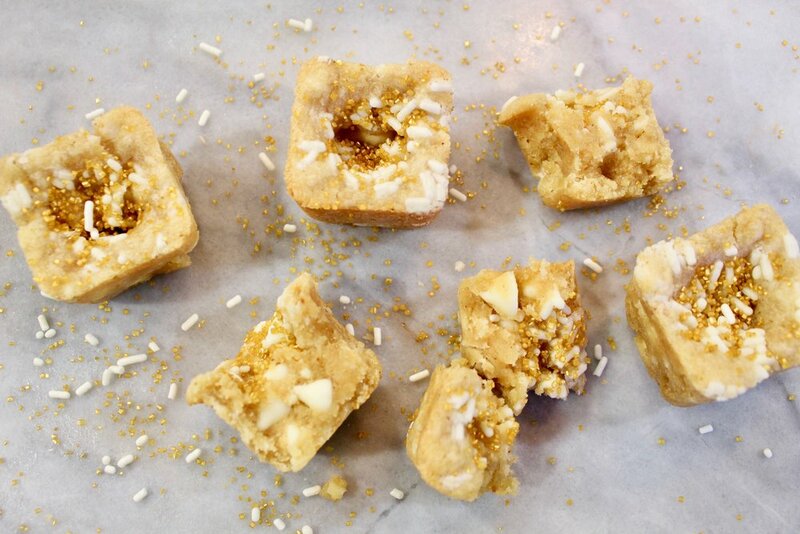 Each Blondie Bombshell is a variety box filled with 12 bite-sized blondies of your choice! Simply "Add to Cart" and you will be prompted to select the flavors you'd like in your variety box (up to 4 flavors per order*). Go crazy! *IF YOU’RE ORDERING MULTIPLE BOXES, AND WOULD LIKE A DIFFERENT MIX OF FLAVORS PER BOX, JUST ENTER THE QUANTITY AND SELECT ‘ADD TO CART’ EACH TIME YOU WANT TO CREATE A DIFFERENT FLAVOR COMBINATION. Share the Dirty Blondie love! This digital gift certificate will create a unique code. The gift certificate recipient can enter this code at checkout to subtract the gift card value from their order total. Still not seeing what you want? Contact me and let me know what you’re looking for. 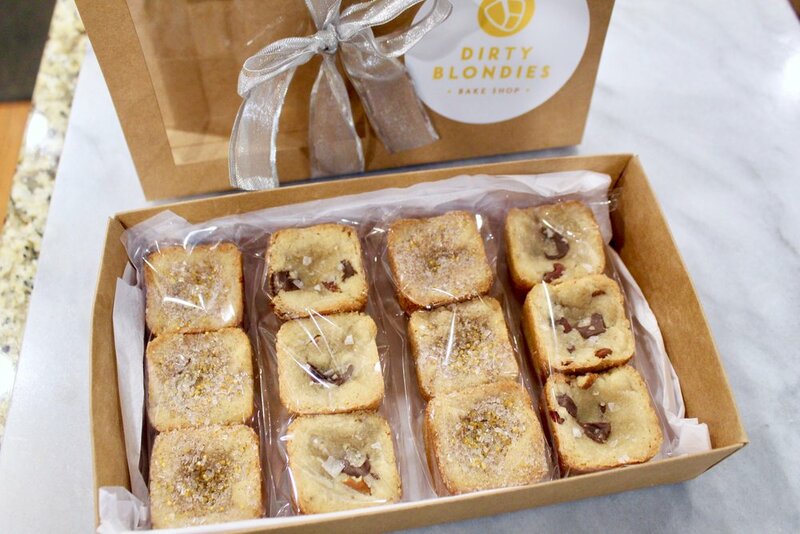 I’d love to create a custom Dirty Blondie package (orders of 4 dozen or more)! Sign up with your email address to be the first to know about new flavors, upcoming events, and other Dirty Blondie news!